This is a continuation of last week's post. 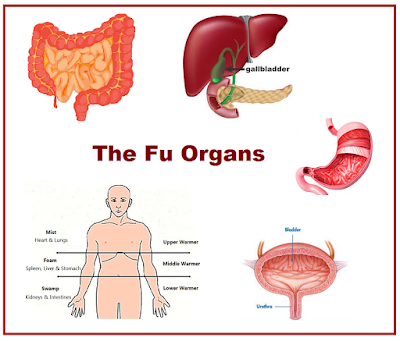 According to the TCM theory, our health is governed by the 5 Zhang (heart, lung, spleen, liver and kidney) and the 6 Fu (stomach, large and small intestines, gallbladder, urinary bladder and triple energiser (sanjiao)). Last week, we had looked at some symptoms given by our body in our daily lives, which we can use to identify which body organ is deteriorating in relation to the 5 Zhang organs. You can access the post by clicking on this link.. This week, we seek to understand the 6 Fu organs.